Mindfulness has been a pretty big buzzword in the last few years. As an antidote for stress and anxiety, and booster of empathy and productivity, it’s no wonder that more people are paying attention. 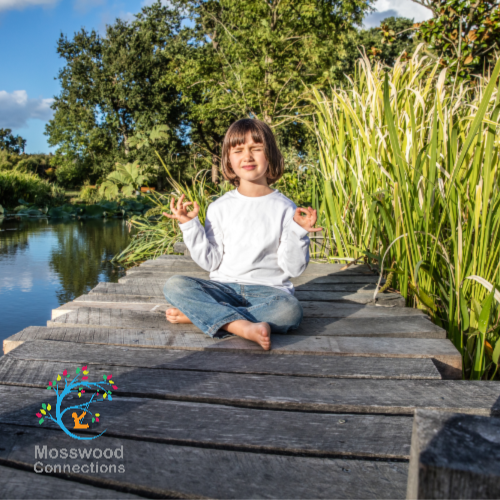 It is becoming increasingly common to introduce kids to mindfulness for these same reasons as well. 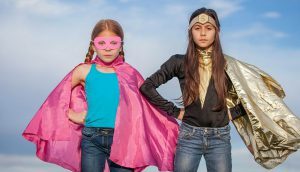 Mindfulness is more widely accepted in schools, and parents of kids of all ages are looking to the practice to help out with tantrums, ADHD, Autism, and daily life. Mindfulness is basically the act of bringing your attention, or awareness, to one particular thing or sensation. You can think about your breathing, listen to one specific sound, or focus on a feeling in your body. It takes practice, though. In order to be truly mindful, you have to keep reminding yourself to bring your attention back to that one thing that you are thinking about. Many people think that mindfulness is about having a mind empty of all thoughts, but that’s not quite it. Mindfulness is in the practice of reminding yourself to refocus on that one thing, to bring your awareness back to that one simple thought. 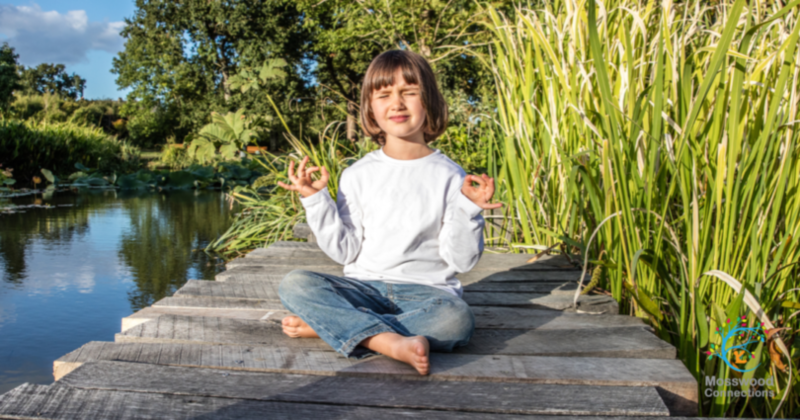 So, how can you add in mindfulness into your child’s life? You can’t know what children are thinking, but there are other ways to help them pay attention to themselves and their surroundings. Then as you talk about what they are noticing, and find acceptance with whatever it is, THAT will help them become more mindful over time. 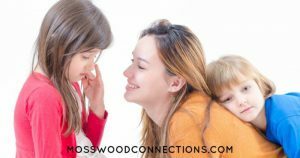 With each activity, make sure to ask questions that prompt your kids to pay attention to the sensations. What do you notice? What does that feel like? Where do you feel that sensation? Talk about these things without judgment, be neutral in your awareness. 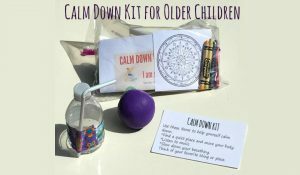 Doing these activities when kids are calm is a great habit to get into. Then, if something goes wrong or is upsetting, maybe they can tune in and remember one of these mindful practices to help them calm down again. Here are some easy ways to add mindfulness to a daily routine with kids. 1. Wake up and stretch: Do some yoga with your little ones right away. 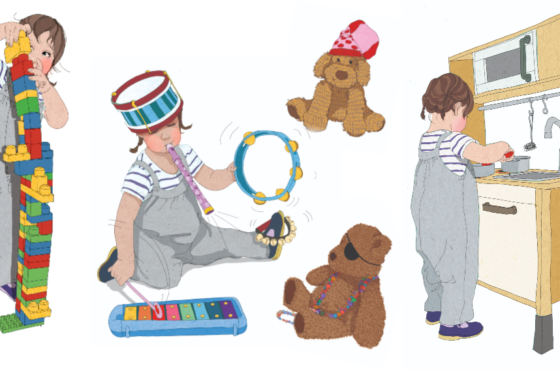 Wiggle your fingers, reach up high, reach for your toes. Notice how stretching wakes up your body. Feel your muscles wake up as you take some deep breaths. The adorable book, Good Morning Yoga, by Mariam Gates, is quite perfect for this. This one is good because you already know you have two full minutes of just brushing your teeth. Take advantage and encourage your child to make little circles on each tooth, going from one end to the other, getting each tooth clean. This is a great game for standing in line, walking through a mall, or even sitting in the car. Who can stand up straight and tall the longest? Focus on lengthening your spine, pretending you can balance a book on your head. Deep breaths help keep your core strong and straight too! 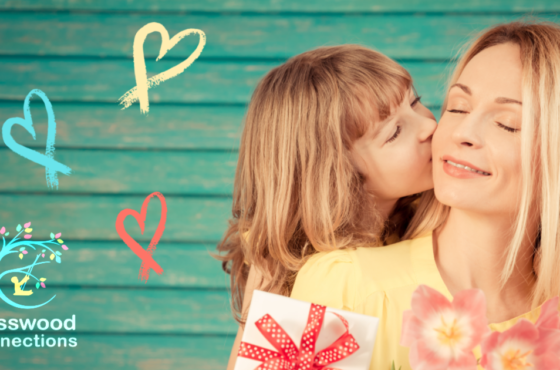 There are so many different ways to practice breathing with kids. Pretend you have five-fingered candles to blow out, pretend to blow up a balloon slowly, smell the flower blow out the candle, trace your fingers, smell and blow on the pizza, and more. Pick a couple of favorites and practice them when you have a minute at the dinner table, in the bathtub, the car, or at the store. Deep breaths are essential for reducing stress and anxiety! 5. Go for a mindful walk outside: No phones, no music, just you and your family walking and listening. Go slow, point out the little things, and talk about them! Notice the birds, the leaves, the clouds, the breeze. Turn around and walk backward to slow down even more and pay attention to how your feet have to move differently. 6. 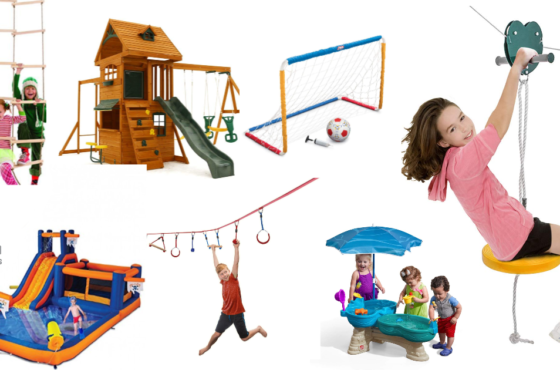 Play I Spy_______: Use descriptive language and describe something visible to you for your kids to guess. 7. One good thing: At the end of the day, think back on all of the things you did, felt, heard, and saw. What was a good one that stands out? Relive it by sharing it with each other, talking about it, and feeling grateful that it happened. 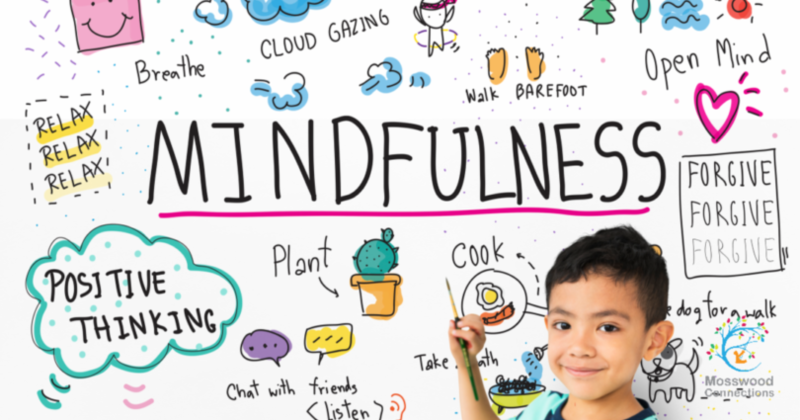 Try these ways to add mindfulness to your day with your kids or students, and even for yourself! Notice the little things around you, pay attention to your feelings (big or small! ), and appreciate the ability we have to be aware of all those things and more. 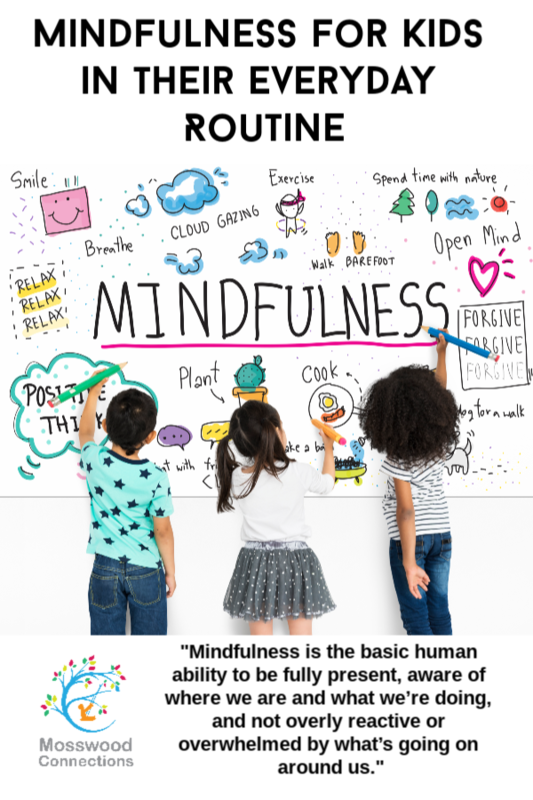 Check out these other articles by Kumarah Yoga on teaching Mindfulness to kids at home and at school! 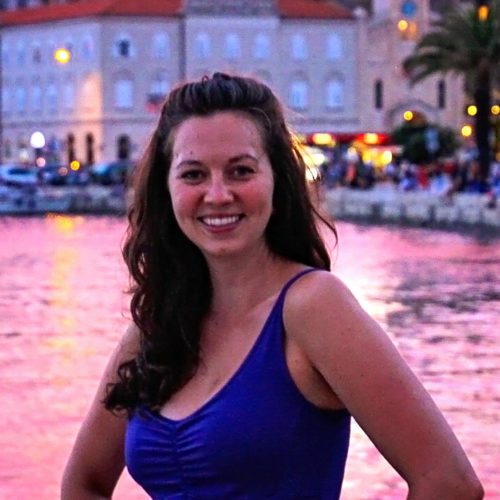 Maia is a 5th year Movement Teacher at Hiawatha Leadership Academy in Minneapolis, MN. She has been teaching yoga, mindfulness, and movement full time to kids for over 6 years. She has trained in Yoga Calm, Little Lotus, Super Stretch, Street Yoga, Baptiste, and Mindful Schools. Maia is also the founder of Kumarah Yoga, an online resource for kids yoga teachers in studios and public schools around the world. She writes blog articles, kids yoga lesson plans, and mindfulness resources. She is especially passionate about teaching yoga to kids with an equity mindset, making sure that yoga can be accessible to all kids of all backgrounds. It is good for all of us.